Hasan Ali, 'Player of the Tournament': I wasn't nervous at all, there was no pressure on me (before the final against India). It was very special to take the last wicket, it was indeed a special moment for me. Hasan Ali wins the 'Golden Ball' award for the most wickets in the tournament (13). Shikhar Dhawan wins the 'Golden Bat' for the most runs in the tournament, scoring 330 at an average of 67. Fakhar Zaman is the Man of the Match for his performance of 114 from 106 balls! Pakistan lift the Champions Trophy 2017 by thrashing India by 180 runs. Jasprit Bumrah is the last man to fall, he top edges it to the keeper and it seems quite apt that Hassan Ali is the one who dismissed him. OUT! India are falling apart after Pandya's wicket. Hasan Ali takes Pakistan little more closer to the ICC Champions Trophy. Ashwin edges it to Sarfraz Ahmed. OUT! Would you believe it? A couple of overs later, Jadeja edges it to Babar Azam off Hasan Ali's innings. His misery at the crease comes to an end. He walks back for 15 off 26 balls. OUT! Huge mix-up! This is absolute mental. Pandya is fuming. Jadeja pats this to to covers and Hardik sets off for a single. However, Jadeja refuses and Hardik is caught well short of his crease. He has to depart, Jadeja should have sacrificed his wicket there, but Hardik, the man who was hitting sixes at will, hast to depart for 73. Kedhar Jadhav to the wicket, but it is Dhoni on strike to Hassan Ali. On the replay of the Yuvi LBW, meanwhile, you can clearly see Shadab on that LBW telling his captain, pehle pad, pucca, pehle pad. He called it right. OUT! Amir has his man. HUGE WICKET for Pakistan. Kohli departs! Kohli's luck runs out. He was dropped off the last ball. This time Amir again bowles one that moves away. Kohli is early into his flick and gets a leading edge to backward point where Shadab makes no mistake. Pakistan go wild in celebrations. DROPPED! Oh dear! Azhar Ali drops Virat Kohli at first slip. Amir with a beautiful outswinger. Kohli gets an outside edge and Azhar juggles before spilling it down. OUT! What a start for Pakistan! Amir traps Rohit LBW! It's a length delivery on middle, nips back in sharply. Rohit is comprehensively beaten by the movement as he looks to defend. The ball hits his pads and they all go up in a huge appeal. The umpire raises his finger. Rohit ponders a review but decides against it. Replays show it was hitting top of middle and leg. Umpire's call! OUT! Kedar Jadhav chips in with a wicket. Babar Azam dances down the wicket to tonk the offie over long off but miscues it to Yuvraj. He departs for a well-made 46. Imad Wasim is the new man in. FIFTY partnership up between Fakhar and Babar in no time, taking just 43 deliveries! Fakhar himself has scored 40 of those runs. OUT! Azhar has to walk back to the pavilion after setting off for a quick single, without realising that Bumrah at square-leg stopped the ball athletically, and threw it back to the vacant striker's end. Too late for Azhar to turn around by the time Dhoni disturbed the stumps. Pakistan lose their first wicket with 128 on board. Azhar brings up his 12th ODI half-century with a single towards the leg side. He has regained his touch in this tournament, and has reasserted himself as Pakistan's first-choice opening batsman! "It's a good pitch. Hopefully we'll score 300-plus here. Today we have nothing to lose, and we'll play good cricket today," says captain Sarfraz Ahmed. Mohammad Amir returns in place of Rumman Raees in what is the only change for the 'GreenShirts'. Indian team: Rohit Sharma, Shikhar Dhawan, Virat Kohli (c), Yuvraj Singh, MS Dhoni (wk), Kedar Jadhav, Hardik Pandya, Ravindra Jadeja, Ravichandran Ashwin, Bhuvneshwar Kumar, Jasprit Bumrah. "We'll try to exploit the grass cover. But the wicket should remain the same. Things are under control when you're chasing a total down. I'm sure the guys are going to enjoy. We're focusing on our strengths, and looking to play some good cricket out here," says captain Virat Kohli, who announces an unchanged team for the Indians. TOSS: India win the toss, and captain Virat Kohli elects to field first! Pitch report: "There is a bit of grass, but it is dead grass, that's because the sun in London is absolutely baked. This is a fresh pitch, not been used at all, and there are some dark areas due to the sun beating down. It is a very good surface. Green and lush outfield. Pakistan will look to get the ball reverse-swinging," says Nasser Hussain. Well that's it from us in our coverage of Champions Trophy 2017. India started off on a strong note with a commanding win over Pakistan in the Group B match, but Pakistan extracted revenge rather emphatically in the summit clash of the tournament, pulling off a 180-run win. The tournament saw its share of ups and downs — from rain spoiling the proceedings in most games, top sides such as South Africa and Australia getting knocked out in the first round to Bangladesh reaching the semi-final of an ICC tournament for the very first time, and Pakistan scripting a fairytale. We had a lot of fun covering this tournament, and with the tournament coming finally coming to an end, it is time for us to bid goodbye for now, though we will return soon in our cricket coverage with the ICC Women's World Cup, as well as India's tour of West Indies. For now, this is me Amit signing off on behalf of my team. Good night! How do you begin to describe this? What do you say to do justice with what this team has achieved? How do you explain anything? Is this how fairytales are supposed to be? Is this how heroes are meant to get their rightful place? ODI cricket in 2017: Pakistan got a little late but they have arrived! Sarfraz Ahmed, Pakistan captain: Specially first of all thanks to Almighty Allah. After the India match, I told to my boys that the tournament is not over yet. Thanks to the team management. And look we are here today. I think he (Fakhar Zaman) is a very great impact player, he played like a champion player. All credit goes to my bowlers. They bowled really well. It is a very young bunch of team and a lot of credit goes to the team management for backing us. When we came here, there was nothing to lose. Very proud moment for me, my team and my country. Thank you very much Pakistan, keep praying for us. India skipper Virat Kohli: I want to congratulate Pakistan. They had an amazing tournament, and proved yet again today that they can upset any side. Really proud of them the way they turned things around, and reached the final. This is what happens in sport. You can't take anyone lightly. With the ball, we could have had a few more wicket-taking opportunities. We've always tried to do our best in certain situations. (On Bumrah's no-ball) Small margins can be massive in cricket. All said and done, we've not won the final, and we've lost a game of cricket. The Indian players are now collecting the runners-up medals. Deafening boos for Indian captain Virat Kohli. Shadab Khan (18y 257d) becomes the youngest player to win an ICC ODI tournament final. The previous youngest was Aaquib Javed (19y 233d), 1992 WC final. Sensational stuff from Pakistan, and there’s a half-hearted pitch invasion from a few supporters as the final wicket is taken. Only about five or six fans who don’t receive a very warm welcome from the pitch security. Comprehensive win for the huge underdogs. Sad end to a great run in the tournament. India looked the best team in the tournament. Yet, on the day when they had everything going for them by way of winning the toss and having the drop on Pakistan, they frittered it away. The bowling was awful, with only Bhuvi and Pandya redeeming themselves. The pressure was too much for Bumrah while Ashwin and Jadeja were pedestrian. No balls, wides, indifferent fielding set the tone for a day of extreme bumbling. Did Kohli err is opting to bowl first? Probably. It allowed Pakistan to take advantage of Bumrah's wayward bowling and calm their own nerves. They set up a massive target of 339 and went about defending it gloriously Mohammed Amir was brilliant. His three wicket-burst at the top ripped the heart out of the Indian batting. The loss by 180 runs with around 19 overs remaining on a placid pitch was as humiliating as it could get. But it brought to the fore that India V Pakistan matches are generally lop sided. Very few have gone to the wire. Hassan Ali, sharp short ball at Bumrah first up and the batsman gets nicely behind it, defends. Not bad, that technique -- the perfect back foot defense, one of the rarest shots now in international cricket. A ball later, it is all over. Very quick, very sharp bouncer at Bumrah's head, he waves his bat, trying to fend it off, gets the top edge up in the air and a delighted Sarfraz barely waits to get the ball in glove before he celebrates. And now the whole team lines up to touch their foreheads to the ground. That then is it, folks. And all you can say is, the best side on the day won, which is what is supposed to happen in sport. Hassan Ali encouraging the fans to make some noise, and they oblige as Junaid runs in. Just a slip in place, Bhuvi on strike and defending on line of off. Waves his bat at the next ball, angled across him, lucky not to touch through, not that it matters much at this point anyway. Junaid has a wry smile, comes back and bounces, Bhuvi goes under it. The batsman then has a huge swipe at the next one, puts it high in the air and manages to land it between three converging fielders, no one knows how. Single for it takes him off the mark; Bumrah ends the over with a single. Hassan Ali resumes and WICKET. Quick, in the channel, very close to off, Ash had to play at it but he is only good enough to feather an edge through to Sarfraz behind the stumps, so we are now down to the final wicket. Bumrah the last man in. Meanwhile, Hassan remains on top of the bowling tree in this tournament -- the highest wicket taker by a distance. Almost cleans Bumrah up with the sort of yorker Bumrah sends down at others -- very quick, an inch close to off, Bumrah jabs down on it a lifetime too late, beaten there for length and pace. Defends to the next ball, on off. And then does it again -- looking quite competent when the ball is pitched up and on the stumps. Okay, fun and games are over apparently. Junaid comes on for Fakhar, begins with a bouncer. Ashwin pushes to point and wants a run. Easily the slowest between wickets, Ash, and there was never a run there. Jadeja tells him to get the hell back. Single behind the wicket on the off brings Jadeja on strike as the senior partner -- Junaid gives him a lifting delivery on length outside off and Jadeja chops it straight into the hands of first slip, so this is getting over quickly after that resistance from Pandya. To lose is no disgrace, but what is going to hurt Kohli the most is the nature of this defeat -- it has been a long time since any team has so totally outperformed India in all departments. The Pakistan quicks are finding pace, bounce and movement at will where Indian quicks were ineffective; their spinners are getting turn, including sharp turn on occasion, and the batsmen thumped the Indian attack without mercy earlier in the day. That is what will hurt -- not defeat, but capitulation on all fronts. Junaid meanwhile bowls out his over, with Bhuvi trying not to get bat to ball and inadvertently edge behind. Hassan Ali finally gets the ball back from Shadab. And there is the breakthrough -- huge mix up between Jadeja and Pandya, and good fielding at point, ends with Pandya run out by the length of the pitch, both batsmen finding themselves at the same end. Pandya lets fly some abuse at Jadeja, then nearly swipes the boundary triangle out of the ground in his anger. Oh dear, it just gets worse for India. Pandya was playing a superb innings but he’s been completely sold down the river by Jadeja there. He’s absolutely furious. Enormous relieved cheers from Pakistan supporters in the ground who were perhaps starting to get a little worried by Pandya’s blasting. Not going to complain about this, really, but keeping Fakhar on with India's tail a wicket away from being exposed is a case of complacency on Pakistan's part. Fakhar makes a decent fist of his part timers, primarily by keeping it on the stumps and not permitting the batsmen room to free their arms and hit through. For four balls, that is -- then Pandya pounces, with back to back sixes; Pandya here is hitting sixes for sheer fun. Shadab is persisted with and this time, to his relief, manages to send down a tight over, just three in the over. India in case you are keeping track need a further 201 runs, as Fakhar Zaman continues. SIX! SIX! Pandya continuing his brilliant hitting. Slogs the second one out of the ground. He is keeping the hopes alive for Indian fans. Pandya is playing a blinder and I am not sure why Sarfraz is not bringing on his pace bowlers to him. May be he wants the batsmen to play a false shot against Shadab. I'd be thinking about Amir and Hasan right about now! Hardik Pandya's fifty from 32 balls today - the fastest in an ICC ODI event's final. The previous fastest was 33 balls by Adam Gilchrist in the 1999 World Cup. Fakhar Zaman continues. And that spree of hitting pulls the ask rate below 8, by the way. both batsmen milk singles with ease, looking untroubled, but then Fakhar is at the very best a part time trundler. Six balls, six singles. Pandya's defiance is good to see. Start of this over, he greets Shadab with another big six. And follows up with another big six. The first was tossed up, and heaved around the corner; the second, lofted straight back against the turn to clear the boundary over long on. And -- incredible stuff this -- ball three is a third successive six! All muscle and timing, ignoring the turn Shadab is getting, hitting each of these shots off the middle of the bat with imperious authority. Ends the over with a four and a single, gets 23 in the over, coasts past his individual 50. SIX! SIX! SIX! Hardik Pandya goes absolutely bonkers. Whacks three maximums off Shadab Khan's bowling and brings up his fifty in 32 balls. Fakhar Zaman gets to continue. Sarfraz could actually be attacking here, bringing back Amir or Junaid for a spell, instead of marking time with his spinners. But anyway, I guess he thinks even if he dawdles through the remaining overs there is no chance of India coming back, so what the hell. Interestingly, the run rate is still just a tick above 8 -- it is the wickets that hurt India here. Three in the over. Shadab to Pandya. Really giving it a rip, the leggie, and he is getting good turn off length. Noticeable about this innings is the attacking lengths Pakistan is bowling; no freebies for India and that plus the pressure of a high chase is clearly telling on the chasing side. 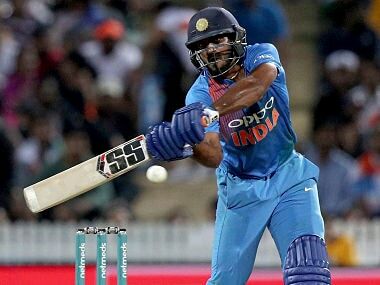 The batsmen now working singles around, one a ball for the first four balls, then Pandya breaks the monotony by going deep in his crease and thrashing a leg break through the covers, covering the turn away from him nicely and hitting with power and authority. Change in the bowling, Imad Wasim takes over from Hussain Ali, who by his standards has been unusually flat today. Spin now at both ends. Jadeja works a single, then Pandya whips the bowler off his pads for two. Meanwhile, recalling Azhar Mahmood's prescient words now. In an interview to Cricinfo in the lead up to this final, he made a comment that deserves to be engraved on stone: Batsmen win you games, he said, but bowlers win you tournaments. Perhaps fitting then that the best bowling outfit is winning this? Imad Wasim bowls three balls and goes off the field. It won't affect their chances though. Shadab continues, Sarfraz resisting the temptation to bring back Amir. Meanwhile, pop quiz -- when was the last time India lost five wickets inside the first 15 overs in an ODI? Shadab Khan is now the youngest player ever (18 years and 257 days) to take two wickets in an ICC event's final match. The previous youngest was Aaqib Javed at the age of 19 years and 233 days. SIX! Hardik Pandya not giving up. He is playing his natural game. He kneels and tonks Shadab over long on for half a dozen. Then the upper cut, superbly played, to a fast bouncer on off stump. That was really quick and Pandya made that difficult shot look easy, landed it one inch short of the boundary. 8 in that over. Latest Update: Hassan Ali, sharp short ball at Bumrah first up and the batsman gets nicely behind it, defends. Not bad, that technique -- the perfect back foot defense, one of the rarest shots now in international cricket. Preview: A wounded Pakistan will be out for revenge while India will aim to maintain their dominance when the arch-rivals meet in the final of the Champions Trophy cricket tournament at The Oval in London on Sunday. Pakistan have been badly bruised against India this series in their opening group stage match, having lost the game by 124 runs via the Duckworth-Lewis (D/L) method. 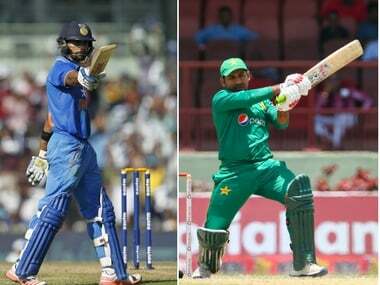 India may be ahead against Pakistan in ICC tournaments by an 8-2 margin, but in all ODI tournament finals Pakistan holds a 6-2 edge in the head-to-head battle against India. Pakistan have managed to bounce back in this tournament, defeating South Africa and Sri Lanka in the group stages and England in the semi-finals to book a berth in the final. With Pakistan's front-line pacer Mohammad Amir declared fit to play in the final after sitting out the previous match, he alongside new ball bowler Junaid Khan will be the key against India to provide their side with early breakthroughs. Pakistan skipper Sarfraz Ahmed will also look to use his team's bowling strength to do the damage against an in-form Indian batting line-up. The spin duo of Imad Wasim and Mohammad Hafeez alongside medium-pacer Rumman Raees -- who made his debut in the semi-finals -- will look to provide depth and variation to the Pakistan bowling line-up. India, on the other side have looked a balanced side with both their batting and bowling departments having managed to click throughout the tournament. India opener Shikhar Dhawan is the tournament's leading run scorer with 317 runs in four matches and will look to continue his momentum against Pakistan. In-form Indian batsmen Rohit Sharma, Virat Kohli, Yuvraj Singh and Mahendra Singh Dhoni have also helped their side look capable enough of chasing any target. The bowling department for India under the likes of pacers Bhuvneshwar Kumar, Jasprit Bumrah, spinners Ravindra Jadeja and Ravichandran Ashwin have looked solid bowling economically while providing clinical breakthroughs. Captain Kohli will also look to use off-break spinner Kedar Jadhav -- who took two vital wickets in his previous match against Bangladesh -- alongside Hardik Pandya to deceive the Pakistan batsmen. 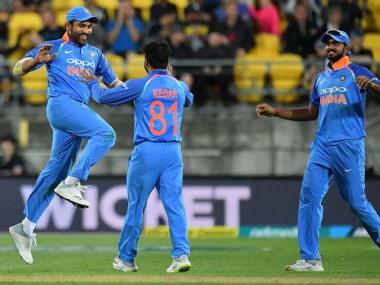 India: Virat Kohli (captain), Shikhar Dhawan, Rohit Sharma, Yuvraj Singh, Mahendra Singh Dhoni (wicket-keeper), Kedar Jadhav, Hardik Pandya, Ravichandran Ashwin, Ravindra Jadeja, Jasprit Bumrah, Bhuvneshwar Kumar, Dinesh Karthik, Mohammed Shami, Ajinkya Rahane, Umesh Yadav. Pakistan: Sarfraz Ahmed (captain and wicket-keeper), Ahmed Shehzad, Azhar Ali, Babar Azam, Mohammad Hafeez, Shoaib Malik, Hasan Ali, Mohammad Amir, Rumman Raees, Junaid Khan, Imad Wasim, Fahim Ashraf, Shadab Khan, Fakhar Zaman, Haris Sohail.